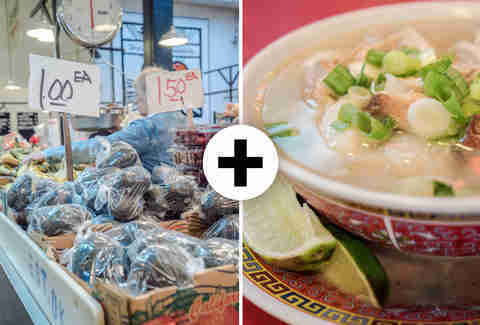 Head to LA’s Grand Central Market, hack together one of these 10 ridic Frankenfoods, and prepare to have the single-item lunch ruined for you forever. 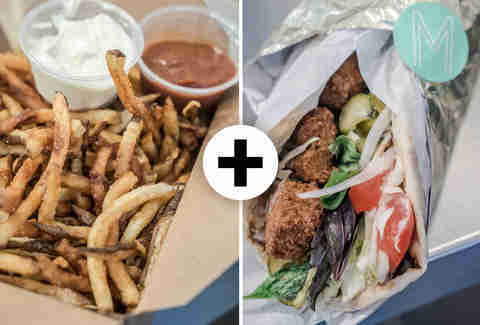 Stuffing French fries into a falafel sandwich is a classic combo. 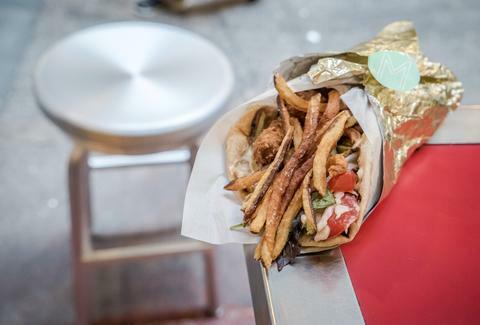 Shoving the beef-tallow French fries sold at Belcampo Meat Co. into Madcapra’s flatbread falafel wraps -- stuffed not just with tiny balls of also-fried chickpea greatness, but pickled veggies and herbs -- is about to become a far classic-er one. 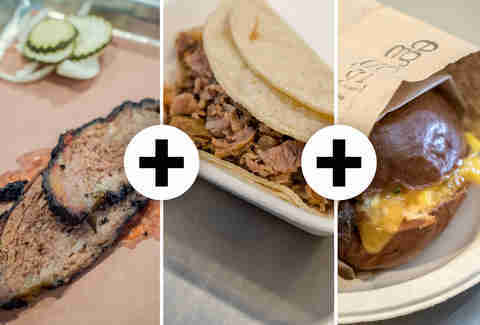 Where to get it: Belcampo Meat Co.
Like DJ Z-Trip, you can't talk mash-ups without a tip of the hat to the OG Grand Central Market combo. 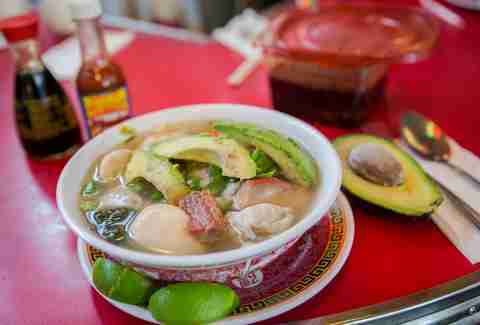 Buy an avocado from one of the vegetable stands and cut it into a bowl of China Cafe's famous wonton soup. Combined with the tub of chili paste and the bowl of limes given to you alongside the soup, it's the ultimate LA Chinese food experience. Dirty horchatas are #trending right now, from Guisados, to the Line Hotel, to Cofax. 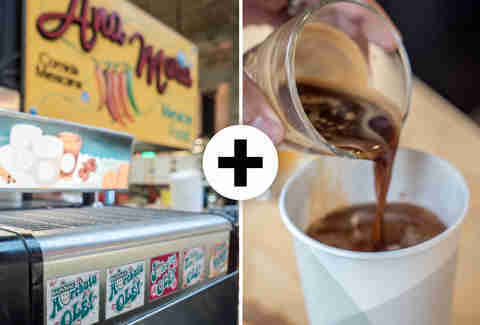 But at GCM, you can next-level the whole thing by adding hipster coffee to it. 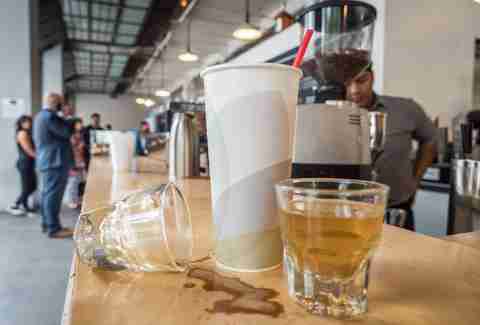 Buy a small horchata from the classic taco stand Ana Maria and take it over to the counter of G&B for a shot of espresso, and then pour it into the Styrofoam cup right in front of the barista so you can see them cry tears of sadness over what you've done to their masterpiece. 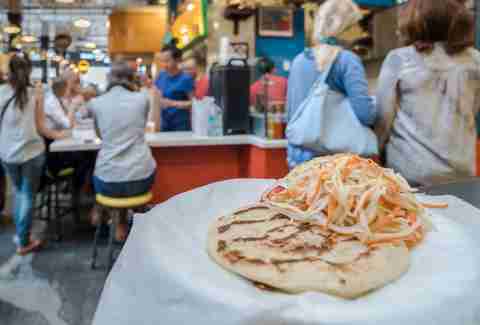 Honor Grand Central Market's classic pupusa from Sarita's by combining it with something from the very first new-school stand to open in 2013, Sticky Rice: a tangy and spicy Thai papaya salad. 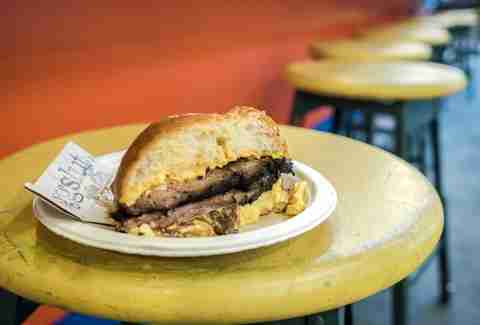 The added sweetness and nuts with the pork and melty cheese? Genius. Solid genius. 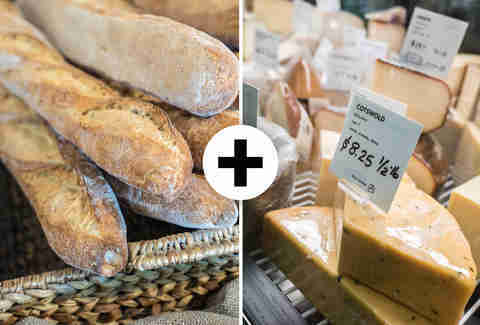 When your food court is home to one of the best new bread bakeries and one of the best new cheese shops in Los Angeles it's only natural that the two will eventually find each other. 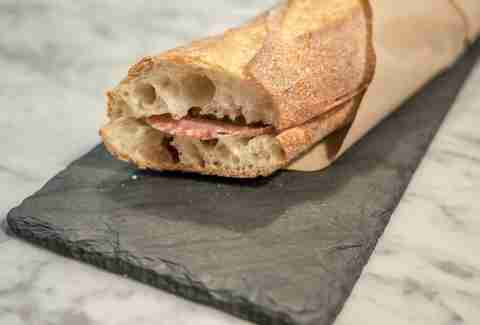 The Clark Street kiosk (which you've likely seen while waiting in the crazy-long line at Eggslut) always runs out early, but luckily you can often find baguettes being sold at the counter of DTLA Cheese. 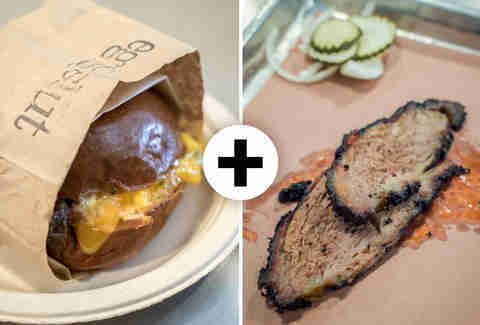 And if you're too lazy to make the mash-up yourself, the sandwiches sold at DTLA are not only made with Clark Street bread but are also kind of amazing. McConnell's, the super-popular ice creamery from Santa Barbara, actually sells its own ice cream sandwich. 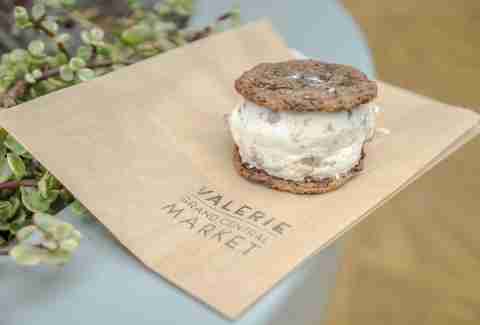 But why settle for two generic-looking cookies when one of the best cookies in the city can be had from the Valerie Confections kiosk around the corner? The small $1 salty chocolate chippers are the perfect size for a single scoop of ice cream, meaning you not only get your amazing ice cream sandwich, but there's plenty of ice cream left over from that small order for a cone. Pro tip: if you ask them at the counter, they'll split the small order into two scoops for you. 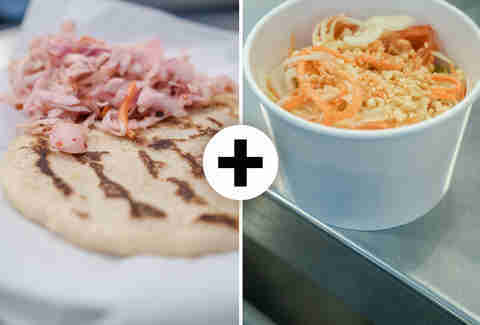 OK, follow along here: most of the remaining mash-ups on this list all use similar ingredients, so you can use some from one and some from another to make all of this epicness, starting with this: the best. Damn. Breakfast. 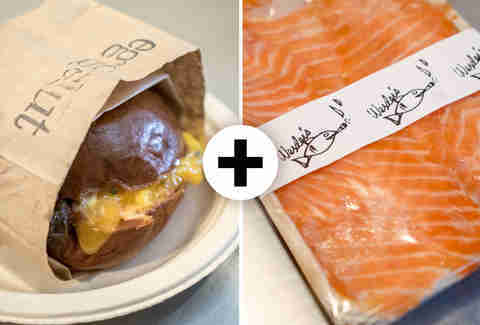 Sandwich. Of. All. Time. Period. End. Of. Story. … Except. For. This. One. Which. Has. BBQ. Beef. Brisket. 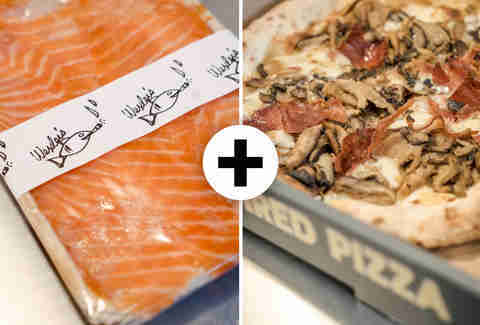 Z. O. M. G.
There’s a classic smoked-salmon pizza at Spago that’ll set you back, like, a bazillion dollars. 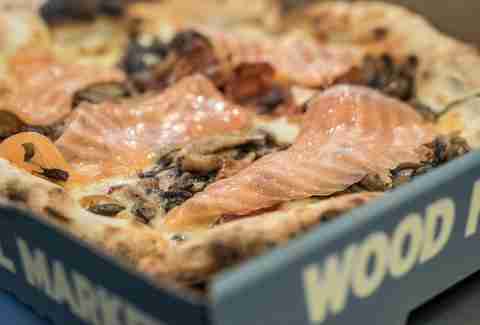 Believe it or not, this one -- which you can use some more of that lox you used, above, for -- plus a killer pie from Olio -- is, like, half the price and twice as good. Believe. 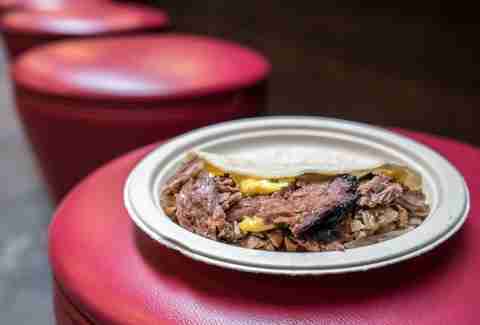 “There are no good breakfast tacos in LA,” people from Texas say, “and no good BBQ either.” Well, turns out they’re wrong. Twice. Just get the carnitas taco from a classic stand, add a little of the extra brisket you’ve got left over, and top it with a bit of the eggs that’ve fallen out of that Eggslut sando, and boom shakalaka. You’re all set. 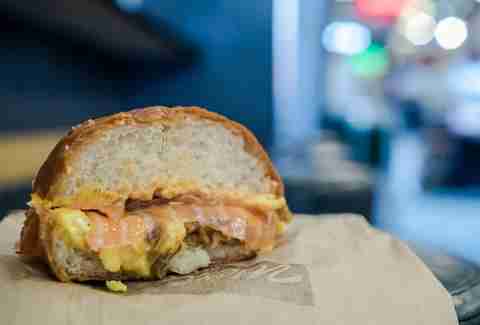 Zach Brooks is the founder of Food is the New Rock and Midtown Lunch, and has spent an exorbitant amount of time at Grand Central Market. Hit him up with other suggestions at @foodisnewrock on Twitter and @foodisthenewrock on Instagram.